The spiral mosque of the Kassem Darwish Fakhroo Islamic Centre is a recent construction - It has become in a few years one of Doha's most famous landmarks. This is not a traditional Qatari mosque but a replica of the Great Mosque of Al-Mutawwakil in Samarra in Iraq. It is located in Souqs area (Close to Souq Waqif) a stone throw from the Corniche Street. The spiral minaret dominating the old city is enlightened at night (See picture). Fanar Center is open from 7.30am to 10pm. However welcome desk is only open from 7.30am to 1.30pm and from 4pm to 10pm. Visits can be arranged at the Qatar Islamic Cultural Center (See information below). The Qatar Mosque is a part of a large building - The Qatar Islamic Cultural Center aiming at explaining Islam to non Muslim foreigners. In addition to the mosque it also includes a department store and a cultural center with permanent exhibition detailing the basics of Islam. Guided visits - tours - of the mosque can be arranged there. 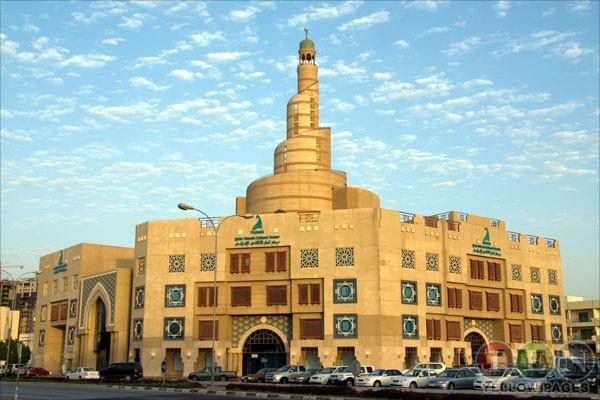 Al-Fanar Islamic Cultural Center is one of the most widely known architectural landmarks in Doha. In this wedding-cake shaped building, non-Muslim visitors are offered extended as well as crash-courses on the Islamic faith. It offers a variety of educational, yet unforgettable, activities, such as exhibitions, tours of the cultural center, visits to the mosque, Arabic language courses and the unique opportunity to attend the khutbah (Friday sermon) in English. The center is happy to meet the visitor before the prayer to explain mosque etiquette, the dos and don’ts.